Of all the things remembered about Sean Fallon, his role in Celtic’s historic 7-1 Cup Final victory over Rangers is sometimes overlooked. The above poem, from the 1958 Celtic Supporters Association Handbook and republished in Stephen Sullivan’s long-awaited biography of Celtic’s other famous Sligoman, highlighted the support’s gratitude for a solid appearance not just at Hampden In the Sun but throughout the 1950s. 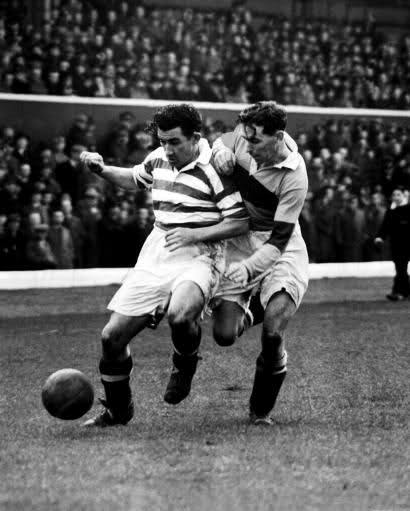 Fallon helped provide the much-needed backbone for a team resplendent with individual talent – and the platform for winning silverware which had become an unfamiliar visitor to the Celtic Park boardroom. It is a decision which all Celtic fans should be grateful for because this is one of the most interesting and important Celtic books published. Here is the inside track on what it was like to play for Celtic in the 1950s and to be part of the management team during the club’s darkest and brightest periods from the early 1960s through to the late 1970s. It also the tale of a football talent-spotter supreme. 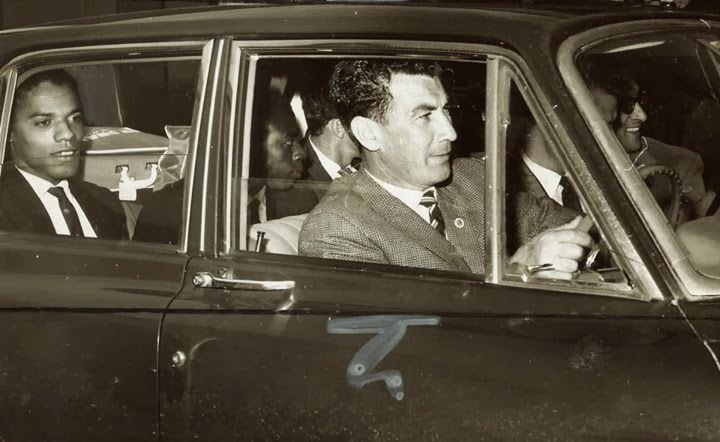 The story is told in a refreshingly honest manner as would be expected of Sean Fallon and it is clear that his focus was not on dishing any dirt but simply setting the record straight – and adding to that public record. He fills some of the blanks about things left largely unspoken in the club’s history. He tells of his working relationship with club chairman Bob Kelly who seized control of team affairs and wouldn’t let them go; the difficulties he faced after being appointed first-team coach by Kelly under his old manager Jimmy McGrory who was suspicious and resentful of the move (on which Kelly had not conferred with the manager); how Jock Stein came to be appointed manager rather than him yet the two former playing colleagues went on to forge a working partnership that drove Celtic to massive success; and how it all came apart at the hands of unscrupulous directors who ignored a previous pledge of a job for life at Celtic Park. And then there are the various stories of how Sean’s famous eye for a player and wonderful manner led him to entice a generation of great footballers to Celtic Park, from Bertie Auld to Kenny Dalglish, Ronnie Simpson to Pat Bonner, Tommy Burns to Paul McStay – and many others in between. Typical of the man he instead praises the work of others involved in bringing players to his attention, including a publican (Danny McGrain), a priest (Davie Hay) and a car dealer (Tommy Burns)! The Quality Street Kids, Celtic’s famed reserve team of the 1960s, were invariably known as “Sean’s Boys” and in this book we have Sean’s take on the success of Lisbon in ’67 as well as the despair of Milan in ’70 and the reasons for both. Some of the most intriguing parts of the book concern the family and private life of Sean Fallon which he freely reveals as he considers these often necessary to understand how his professional life played out the way it did. To this end, while much of the book is based on detailed interviews with the man himself, it also benefits from input from a range of observers and participants along the way (including Sean’s wife Myra and children) so that the author wasn’t left to rely entirely on his subject’s recollections. On occasions the former players and colleagues interviewed challenge Sean’s position on certain matters, giving this football book an unusually open and critical approach is welcomed. We come to understand how his life-long commitment to Celtic was inherited from his father, who lived for a while in Glasgow as a young man and caught the Celtic ‘bug’ then. His father was a former British soldier whose decision to enter local politics in Sligo and run for Mayor despite challenges from Republicans provides an interesting slant on the ‘poppy’ remembrance issue which continues to generate controversy around Celtic and its support. His son went on to represent Ireland at international level but became embroiled in controversy of his own when he decided to play for the northern Irish League against the Republic-based League of Ireland whilst a Glenavon player. This appearance, however, opened the door to a move to Celtic – as did Sean’s decision to shave almost six years off his actual age to persuade the club they were securing the services of an enthusiastic 22 year old as opposed to an experienced 28 year old! The lie was maintained for a number of years and it proved to be in Celtic’s best interests as ‘The Iron Man’ played in the first team through until his mid-30s despite a series of bad knocks and injuries which would have been the ruin of lesser men. Personally, the most fascinating aspect of the book was the illumination it brought to the key period of the late 1950s through to the mid-1960s. From the experimental Kelly Kids (effectively the Busby Babes without the significant Busby input and guidance) to a series of debilitating and high-profile cup defeats before the return of Jock Stein to the club, here we have an insider’s account on what was going so badly wrong behind the scenes at Celtic Park. 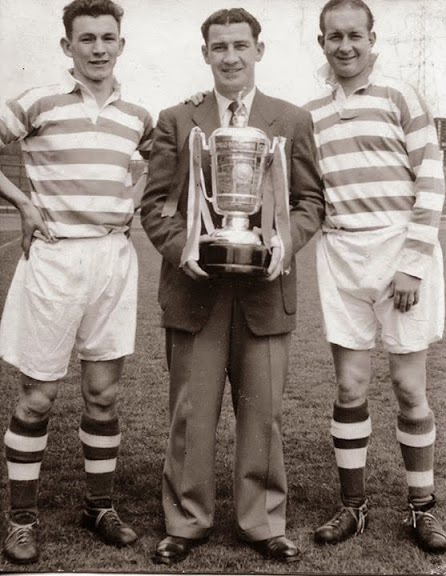 In the eyes of the players, Sean Fallon was the man to turn their fortunes around – yet when given the opportunity to do, he appeared not to take it. This was largely down to his complicated relationships with Jimmy McGrory and Bob Kelly­ and, crucially, the absence of effective leadership at the club. 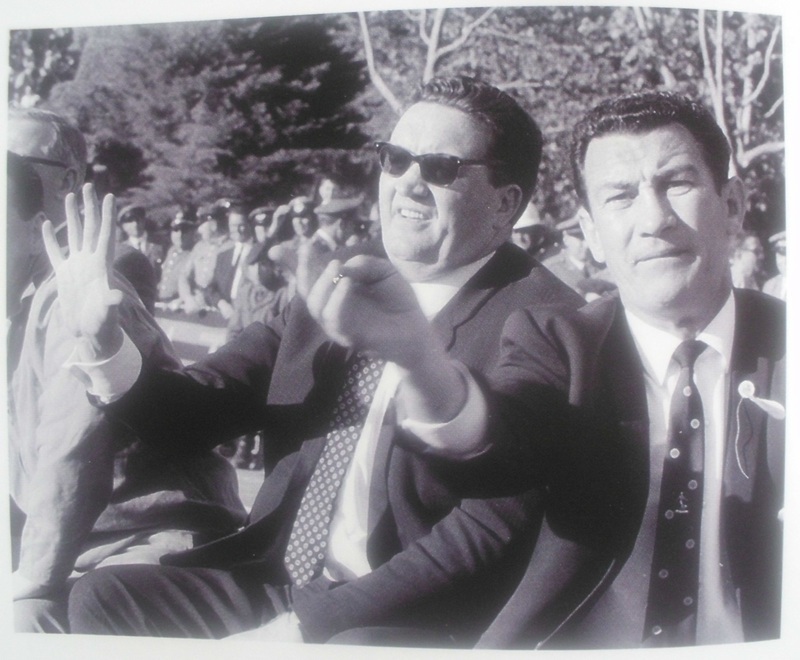 While Sean Fallon never lost faith in his own ability to manage he was equally convinced that acting as assistant to his good friend Stein was an appropriate and rewarding way for him to maintain his key professional aim – to serve Celtic Football Club to the best of his abilities and in its best interests. 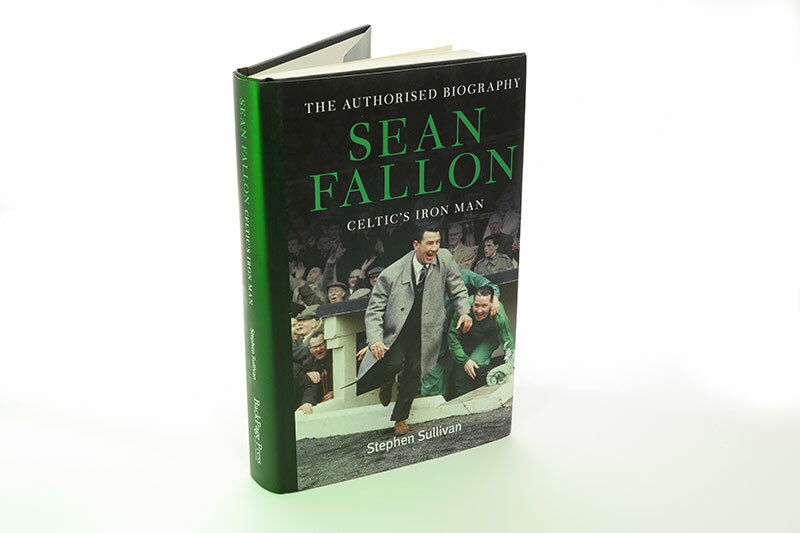 There is so much of value in this book that it’s unlikely any Celtic supporter, no matter how much they know about the club, will not learn something new from Sean Fallon’s story and the entirely engaging way it has been told here. Sean’s dedication to the cause of Celtic was illustrated late in his life on 20th March 2012. That was the occasion on which the Celtic Graves Society organised a commemoration in honour of Michael Dolan, Celtic’s first ever goalkeeper, at a Lanarkshire cemetery which formed part of that year’s Coatbridge St. Patrick’s Festival. 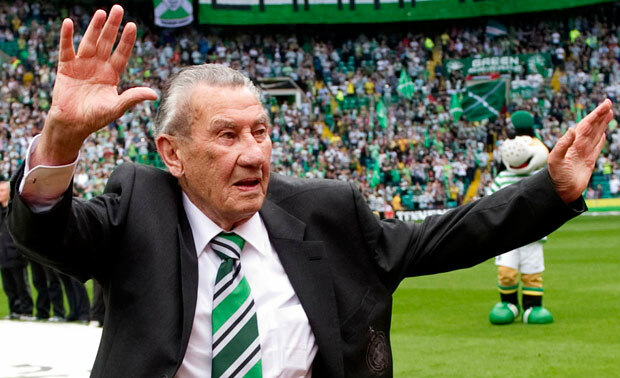 Despite being just four months short of his 90th birthday Sean delighted every Celtic supporter present by taking the time and effort to attend and speak at the event. Fortunately the whole Celtic support had the opportunity to remind Sean he had a place in their hearts a few months later when, before a packed Celtic Park, he unfurled the league championship flag on August 4 2012, to a magnificent roar around the stadium. It was to be a final public hurrah in the service of the club he followed devoutly, with Sean passing away on January 18th the following year. The Iron Man legend lives on however. 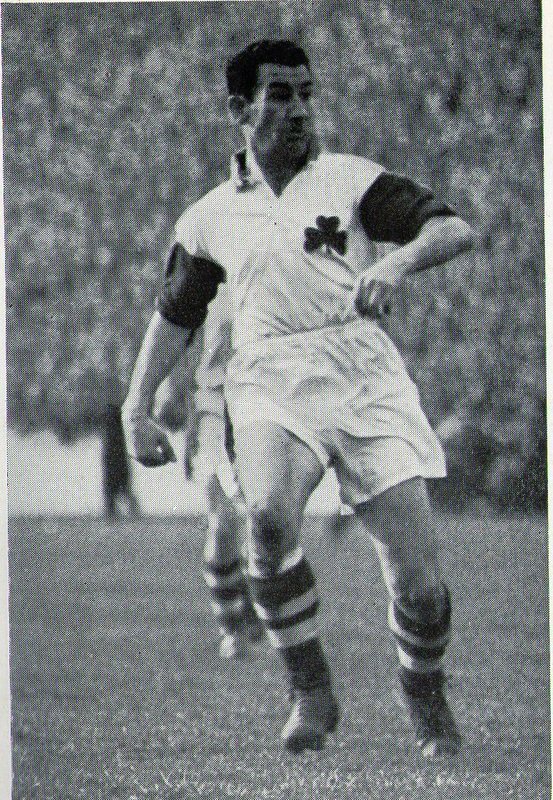 After sustaining a double-fracture to his arm in an accidental collision with the Celtic great Jimmy Delaney in the first-half of a game against Falkirk in December 1952, Sean’s decision to play on drew admiration from Delaney who felt compelled to write to the Sligoman after the incident: “The fact that you played right through the rest of the game proves you have the old Celtic spirit.” It is that wonderful Celtic spirit, something that Jimmy Delaney knew all about, which infused Sean Fallon’s life and which the author has done a magnificent job in capturing here. For those grandkids he has certainly put something special down and this book represents a true appreciation of a great, humble and honest man – whose life was dedicated to his family and Celtic. 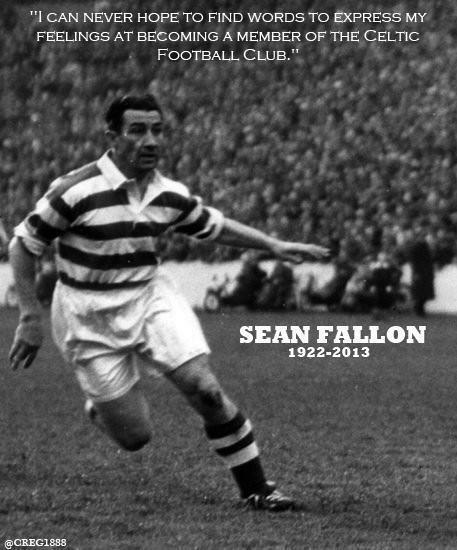 This excellent biography will help ensure that Sean Fallon long remains a shining star in the Celtic galaxy. The 1958 poet was right in his prediction: time has not dimmed in his lustre.